Design and installation | Evotronics Kft. Our company undertakes the preparation of electrical permits and construction plans. To do that, assessment of the project is required. Please contact us with confidence for a quote. 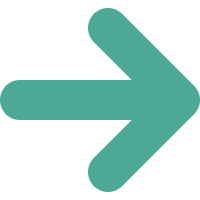 For freelance designers, our design guide is available, which can be downloaded from our website. The plans of the one-line electrical path of the 16 operational channel can be found in CAD file and Open Office format, so these only need to be filled by the designers. Pre-made circuit diagrams of all functions of the Kameleon System are available for our electrical designer partners in CAD and Open Office format. With the help of the guide, the control of a smart home can be easily designed. On request of the customer we undertake the complete implementation of the building automation system, which includes the installation and set-up of the device. During installation we establish the power supply that the Kameleon System requires, we hook up the consumption units like lamps, dimmers or shutters and their control inputs, which are usually push buttons. If the user wishes to operate his property from his smart phone, we provide the necessary communication modules. 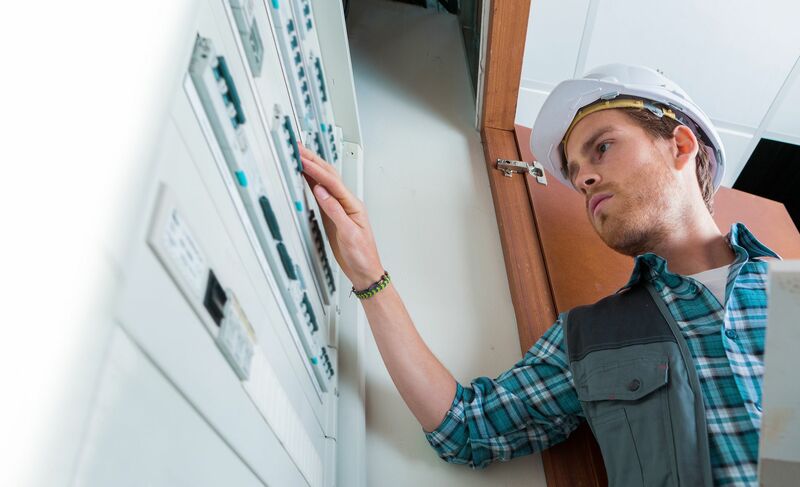 The Kameleon System building automation system can be easily installed with basic electrician knowledge because there is no need for a programmer. For installation it is enough to choose the desired mode with the help of the rotary switch and connect the proper inputs and outputs. Their wiring diagram can be found in the installation guide. The device contains the necessary pre-programmed control software for building automation, thus saving money and time for the users. The basic functional concept of the Kameleon System is that one Kameleon Light device operates one function. So, for example one module controls lighting, one controls the shutters and one other the heating, all separately. 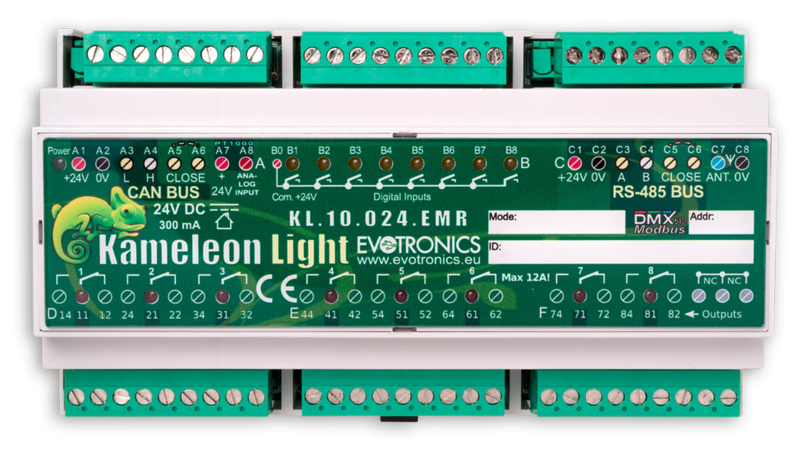 Because the device has a finite number of in- and outputs and usually more circles are needed for a given function, the solution is to install more Chameleon Light modules with similar functions into the system and connect them with the system bus. During the installation of the Kameleon Light module the first step is to provide the 24V DC voltage, which will require an external power supply. Following the installation of the ground and the 24V (’A’ plug) the green LED of the power will be constantly on, at the top left side of the Kameleon Module. 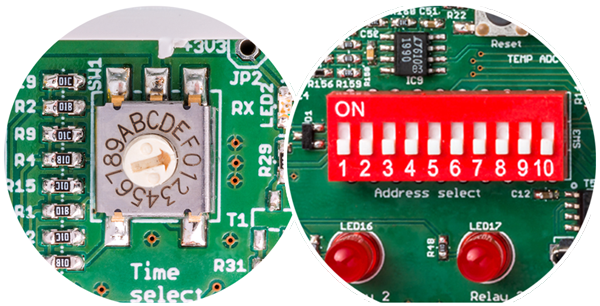 The proper mode needs to be selected on the module with the help of the ’Mode select’ rotary switch, which is found under the front panel, then the device needs to be reset. The device will operate in the chosen mode. Further timing parameters can be set with the ’Time select’ rotary switch, where the division differs from one mode to another. 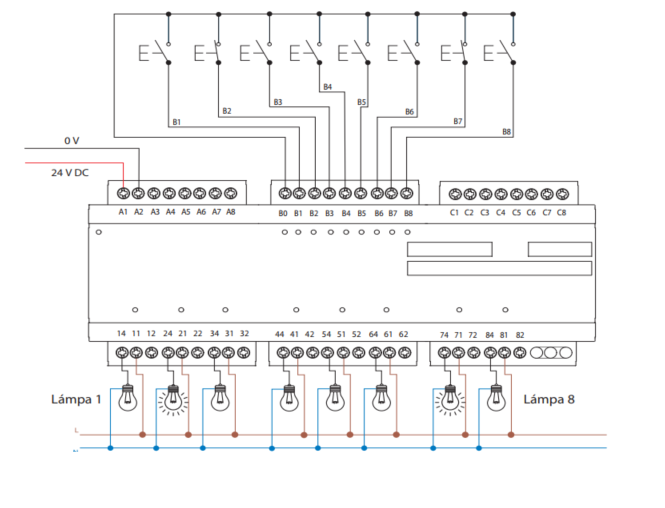 The next step is the connection of the inputs on plug B, where the BO point provides the joint 24V point, which controls the 8 inputs through the push buttons. Any number of push buttons can be connected to one input, if for example it the operation of the lightning circle is needed from multiple locations. The active status of the push buttons is indicated with 1-1 yellow warning LED. In different functions the push buttons are tied to the outputs in different ways. In case of lightning control for example, the 1. push button controls the 1. output, while the 2. input the 2. output and so on. In case of two push-button shutter control, already 2 in – and outputs belong to the shutter control circle, so for example the 1. and 2. input means the up and down direction, which control the 1. and 2. output, which provide the two-way movement of the shutter motor. The wiring of the outputs is done through D, E and F plugs, which are the outputs of the relays. The phase of the circuit needed to be controlled, is connected to the NO point that is open in the basic output position. The active state of the outputs are indicated by 1-1 red LED. FURTHER SETTING: With the help of the Time Select rotary switch and the DIP switch, the following options are possible, depending on the given function. Time Select: the settings of the timing parameters of the given functions (for example the running period of the shutter or gate control function). DIP switch: other setting possibilities of the given function (for example the setting of level control in case of light or shutter control, if the group controls need to be levelly separated). In case of using more devices or communication modules, the CAN bus plugs need to be closed through the ’CLOSE’ points in the interest of trouble-safe operation. 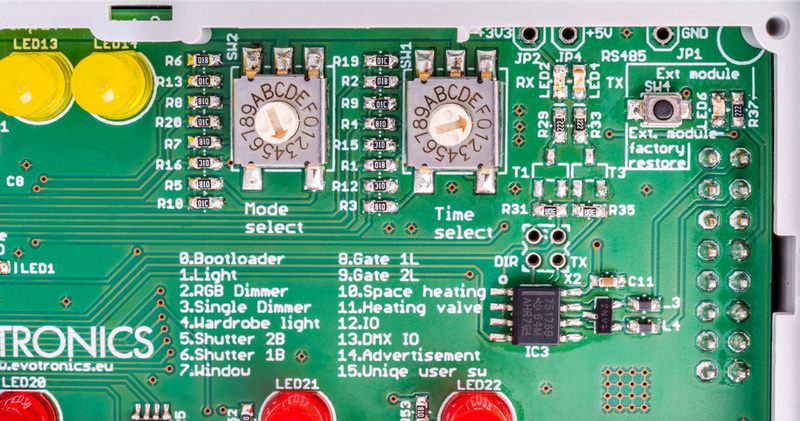 The device contains the closing resistors which are needed for closing, but to the regulated points of ’A’ (CAN bus) and ’C’ (RS485 bus) plugs a short circuit must be connected. Within one system there can only be 2 shutters, if possible at the 2 utmost distant points of the bus! This can be easily checked, on a well-closed bus system in off mode, 60 Ω resistance can be measured. If only one device and one built-in communication module operates, the shutter points of the device must be connected still. 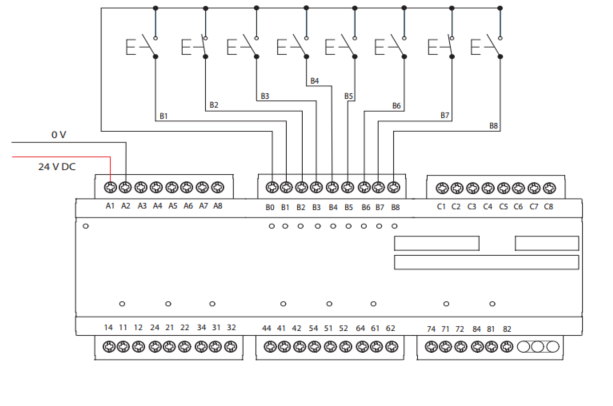 If the device is operating in a mode which requires the connection of and outside device on the RS-485 bus, then in this case the RS-485 bus must be shut as well through the RS-486 shutter, and through the bus shutter points of the connected device. 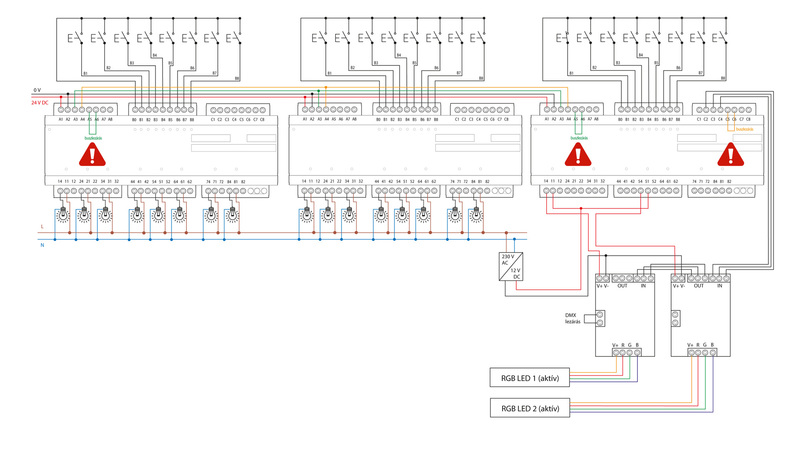 For example: mode bus, dimmer, RGB dimmer, heating/cooling control, shutter control.